Although this year’s winter has been relatively mild, wild goat kids are scarcer than usual on Islay, Jura, Rum, Kingairloch, Kllmalieu and elsewhere on the west coast. The reason suggested to me is predation by an expanding sea eagle population vying with the golden variety for what little food there is. This explanation may or may not be the case as these and other raptors have not yet produced hungry young. Doubtless the growing scarcity of red deer calves through over-shooting of hinds on many estates is having a knock-on effect. Ever since goats were introduced by man in early times they have proved to be useful. Many seem to have been allowed to run wild or were turned loose even before the great Highland clearances. 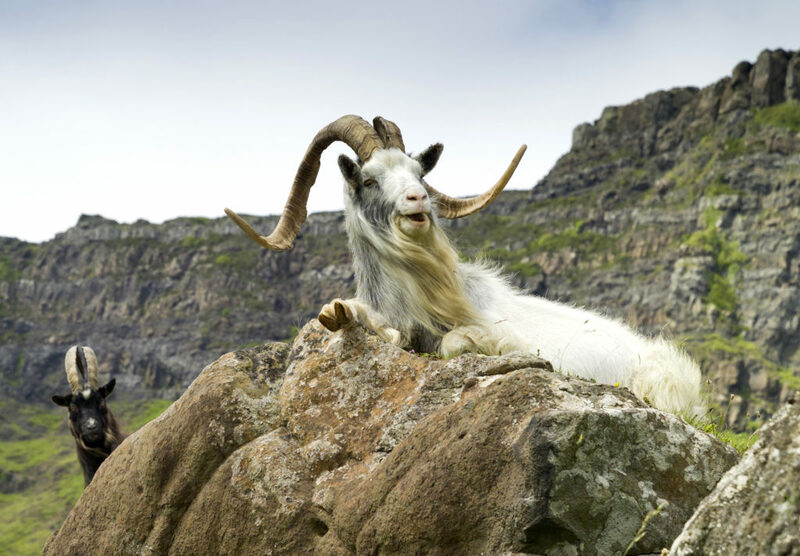 Thomas Pennant, who wrote about a tour he made in Scotland and a voyage to the Hebrides in 1772, remarked that the goat, ‘most local of our domestic animal, confines itself to the mountainous parts of these islands’. There are early reports of them being in Sutherland, Ross-shire, Dochfour on Loch Ness, and North Morar, where there used to be an old established herd, advertised as among the attractions of that estate when it was put on the market in 1930. The late Lord Burton, who owned Dochfour and much of Glenelg, used to tell an amusing story recounted by his grandmother who was present, of Queen Victoria coming off the royal yacht when it was anchored in Loch Duich on the Sabbath and going to church at Balmacara. 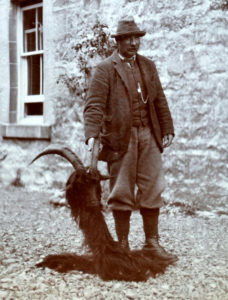 Goats were mentioned in 1835 as being numerous in Glenmoriston and Glen Urquhart but were shot because they were injurious to woods and plantations. Before the Second World War, there are records of them on Lochnagar, the Slochd and Glen Callater. Goats, along with their kids in the latter, have been photographed at about 3,000ft above sea level. The goats of Inversnaid, on Loch Lomond, are reputed to possess a pedigree dating from the time of King Robert the Bruce, who ordered that they should never be molested. 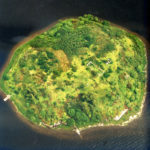 That is until they killed off the yew trees on the island of Inchlonaig on Loch Lomond which he had planted for his archers. It is said that the bows from these were used at the Battle of Bannockburn. Ulva, off Mull, had what is called a ‘trip’ numbering 20 to 50 shy, agile animals of mixed colour. Not so many years ago they were marooned on a tidal islet in the Sound of Loch Tuath and, on trying to return through a high tide and strong wind, about 20 out of 25 were drowned. I don’t quite know where my sympathies lie. It was all very well for the Duke to issue these instructions from London, but quite another for the poor factor to carry them out given the remoteness of Mull and Morvern at the time. It must also have been difficult and hard for the tenants to give up their goats when there was precious little else in the way of stock to sustain them, although the Duke seemed to accept sheep weren’t quite as destructive. Given the popularity of goats among cottars, crofters and farmers in the Highlands and Islands, it will come as no surprise to hear that they feature in many Gaelic songs. The best I know of is a song-poem called Of Goats and Men and is one of the longest surviving Scottish Gaelic poems composed in Canada. It is set as a dialogue between the poet and a goat who meet in a Gaelic township in Ontario and reminisce about life in the old Highlands. It was composed by Alasdair MacMillan, whose father belonged to a branch of Lochaber MacMillans known as ‘Clann Iain Leatha na Coille’. His mother, also a MacMillan, belonged to Sunart. Alasdair was born in 1764 at Resipole but was raised in Lochaber. In 1802, he left Glenkingie for Glengarry, Ontario where he died in 1853. Poems of this nature and quality were written not only as a reminder of happier days in the old country, but as a means of expressing tongue-in-cheek comments about landlordism and the injustices foisted on the Highlanders – something established bards could do without fear or favour. 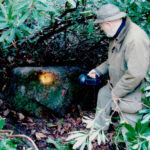 I often think some of today’s landowners and government quangos are fortunate there are few, if any, bards around with the literary skill to name and shame – there is certainly no shortage of material. The human-animal dialogue in Alasdair MacMillan’s poem was fairly common. The best known examples are a complex 430-year-old one called Oran na Comhachaig (The Song of the Owl), in which an owl recalls the glories of olden days in Lochaber to a poet-hunter, and a poem by a Badenoch bard in which the author poses as a hunter having a conversation with a deer, with the deer teasing him for having to wear trousers after kilts were banned for civilian males in 1746. The text of Of Goats and Men moves around Knoydart, Morar, Ardgour, Conaglen, Arisaig, Morvern and Moidart commenting on the haunts of the poet’s boyhood rather than in Ontario where it was composed. It engenders a strong sense of belonging and of ‘duthchas’ and contains many place names which are no longer used and have not been recorded. Acknowledgement: I am grateful to His Grace the Duke of Argyll for permission to quote from the Inveraray Castle Archives.